Sometimes everyone needs a friendly reminder of this. It’s really easy to fall into the trap of feeling like a complete failure and endlessly listing comparisons between yourself and another. I’m fully guilty of it and no doubt it really plays on your mind. We’re heading into an age where social media popularity and/or “fame” is thriving and throwing new beautiful people our way. Take instagram for example. It’s the app I probably spend most of my time using. Partly for inspiration for outfits, random things and to be honest I’m just plain nosy. I can find myself scrolling through a whole timeline, cautiously trying to avoid the 83 week ago like slip, getting more and more defeated? I don’t know if that’s the right word. Being a girl (and obviously applies to guys too) is tough. There’s a lingering feeling of never being good enough always latched onto you. 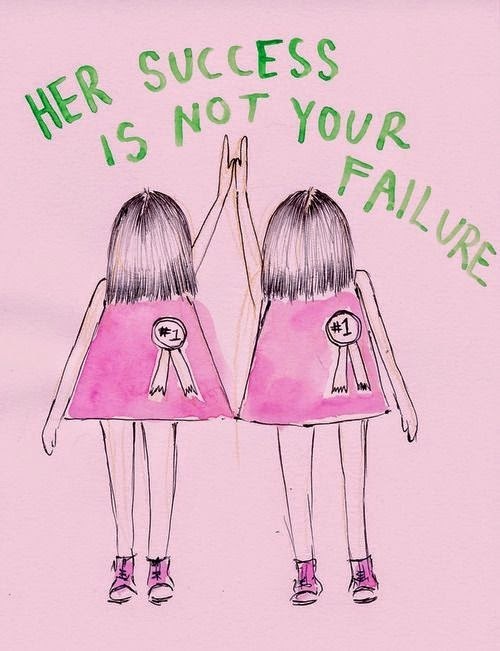 It’s not healthy to constantly compare yourself to others and think how wonderful they are and neglect yourself. I think for some people to say “I like my eyes/nose/cheek bones/face in general/body shape” comes with the fear of being seen as full of yourself. Body image is a huge pressure on many people’s lives and trust me I know how hard it is to look at yourself and be completely content. However, I’m learning to look at myself and be confident enough to say “Hey, I like this about myself and isn't that great!” without fearing I come off in the wrong way. If we’re comparing our own lives to those on instagram or YouTube, we’re comparing ourselves to the bits we do see. We don’t see them doing massive cries about how crap life can be or see them when they’re in full hangover mode in last night’s makeup cringing into a pizza box screaming “WHY ME”. We see the parts they choose to share. So we might imagine these people have a wonderful life and look red carpet ready all the time when in most cases, it’s not. My friend Shannon tweeted this the other day and I couldn't more preaching hands emoji if I tried. Just because someone is doing incredibly well for themselves it doesn't mean you have to cut yourself short. You can do anything if you put your mind to it; there isn't a specific formula for success. I see all my friends who are at university doing really well and doing all the things university life entails. (The funny thing is I always saw myself going until the time came). The social life and great qualification, sometimes it makes me think I’m doing something wrong. I don’t go out every week, more like every couple of months. So am I missing out on meeting great people? People say uni years are the best years of your life, so am I missing out on those said best years? For me, when I really think about it and come out of my pre 20 life crisis mode, No. I made the best choice for me and funnily enough, I feel successful and happy. I left a college I hated to go back to my old sixth form, to leave not knowing what to do, to passing my apprenticeship at the highest level in that particular field , to be in a job now that’s intended for graduates. At 19. It was hard work but I’m so proud of myself for doing it. Is that not a success? You don’t need to follow the same path as everyone else to get somewhere. Make your own and support and motivate those around you! Nothing beats a strong lady friendship. It’s the old saying, Work hard, Play hard. *photo from tumblr, I can't find the direct link. YES, TRUDY. yes. nail on the head. great advice, i can definitely relate to this! TRUDY you continue to wow me with every blog post you put out. I love this. This post really put me in a better mood. It also made me feel better about liking my face and my body. Amazing message!